Systems and methods for assessing an individual's physiological condition are provided. Cycle and shape parameters are derived from a recorded time trace containing heart rate data collected while an individual performs a cyclic exercise routine. Individually tailored exercise regimens that are based on these parameters are generated and modified as desired. Appendix A contains actual exercise regimens appropriate for individuals with nominal capacity indices ranging from 120 to 180 units, in accordance with this invention. FIG. 1 shows illustrative systems for assessing an individual's physiological condition during performance of an exercise regimen. Individual  10 is shown exercising on exerciser 20. Exerciser 20, for example, can be a treadmill machine, a trampoline, a stationary bicycle, or any other suitable exercising apparatus. Exerciser 20, however, is optional because exercise can be done without the aid of an exercise apparatus (e.g., running, jogging, jumping, walking, moving arms and shoulders, or swinging legs). Electronic monitor 30 monitors the heart rate of individual 10. Monitor  30 can be any commercially available unit that measures the heart rate and transmits heart rate data to recorder 40 through link 50. Link 50 can be, for example, a magnetic coupling, a wireless transmission system, or any other electronic or electromagnetic network. Monitor 30 can be connected through link 50 to user interface 60. Interface 60 can provide to users visual, auditory, or tactile information regarding the heart rate or any other type of data. Recorder 40 can be, for example, a printer, a chart recorder, or other device (or combination of devices) that can record the time trace in an electronic file 70. Monitor  30, recorder 40, link 50, and interface 60 can be obtained commercially as an integrated heart monitoring and recording unit (such as Model Polar M52 or Model Polar NV sold under the trademark POLAR™, by Polar Electro Inc., of Woodbury, N.Y.). Link 80 connects recorder 40 to analyzer 90, and can be local or remote to exerciser 20. According to one embodiment, and as shown in FIG. 1, link 80 can include watch reading interface 81 (such as “Polar Advantage Interface System” Model 900622K sold under the under the trademark POLAR™, also by Polar Electro Inc.), personal computer 82, and Internet link 83. It will be appreciated, however, that link 80 can be any electronic network that couples recorder 40 to analyzer 90 for data communication. Analyzer  90 can include one or more electronic computing devices, preferably programmable computing devices (such as Model HP-VEE sold by Hewlett Packard Company, of Palo Alto, Calif.). It will be appreciated that analysis could, in some cases, involve manual computation or review. Analyzer 90 analyzes electronic file 70, which contains at least one time trace of the heart rate, to determine at least one exercise cycle parameter (e.g., a maximum heart rate). Based on that parameter, analyzer 90 can calculate a heart wave index indicative of the individual's physiological condition. FIG. 2 shows illustrative exercise regimen  200, which includes exercise session 201. FIG. 3 shows corresponding illustrative time trace 300 of an individual's heart rate, when exercising according to session 201. Exercise session 201 includes five successive exercise cycles 210-214 of increasing difficulty with each of cycles 210-214 associated with generally increasing target heart rates 215-219. It will be appreciated that an exercise session according to this invention could include more or less than five cycles and that the target heart rates need not increase monotonically. In each of exercise cycles  210-214, the individual is expected to commence physical activity and continue the activity over first time period 222 in an attempt to raise the heart rate to one of respective target heart rates 215-219. Period 222 can be fixed or variable. Preferably, period 222 is variable but has an upper time limit. When period 222 is variable and has an upper time limit (e.g., variable cycle 214), the individual exercises only until either the target heart rate is reached or the upper time limit is reached. Preferably, the upper time limit is about one minute. However, when period 222 is fixed, the individual exercises for a fixed amount of time even if the individual's heart rate goes over or stays under the target heart rate. Period 222 when fixed is preferably between about 30 seconds and about 90 seconds, and more preferably about one minute (e.g., cycles 210-213). One type of variable cycle is a spike cycle. In spike cycle  214 (represented as “S”), an individual exercises as vigorously as possible to reach target heart rate 219 in as short a time as possible. Thus, the actual time period depends on the condition of the individual. In each cycle  210-214, after initial period 222, the individual relaxes during time period 223 by gradually diminishing, or preferably, by abruptly ceasing physical activity. Period 223 can also be fixed or variable. Preferably, period 223 is variable and ends when the heart rate substantially stabilizes (i.e., levels off). A heart rate can be considered “stabilized” when the heart rate changes less than a certain amount over a pre-determined period of time. For example, a heart rate can be considered to be stabilized when the heart rate changes less than about 3 beats/min. over an interval, such as a one minute interval. Exercise session  201 can include intervening rest periods 224 between successive exercise cycles 210-214. Additional intervening rest period 224 can also be inserted before post-exercise recovery period 225. 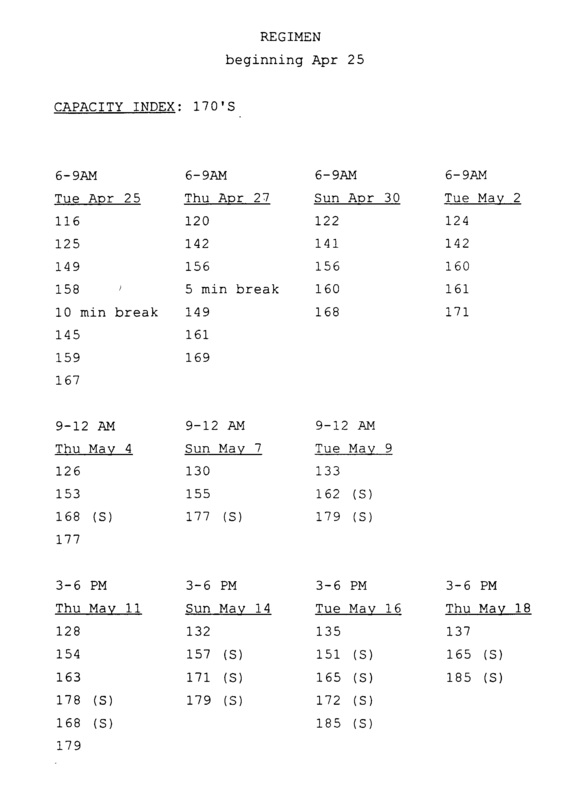 Rest periods 221, 224, and 225 can have fixed durations or can be determined by the individual's performance by the amount of time required for the heart rate to substantially stabilize. A time trace can contain heart rate data collected over any time period ranging, for example, from a few seconds to several days. Thus a time trace can include data collected over a single or multiple exercise cycles, sessions, or regimens. FIG. 3 shows illustrative time trace  300 of an individual's heart rate during exercise session 201. Trace 300 includes pre-exercise portion 310, which represents the heart rate during time period 221. During period 221, the individual can stay still, acclimatize to exerciser 20 and surroundings, and allow the heart rate to stabilize over several minutes before commencing an exercise cycle. Portion 310 is believed to contain information on the individual's resting heart rate and can serve as a reference or base line heart rate from which to assess changes in the individual's physiological condition, for example, due to exercise. Each of portions  320 represents a rising heart rate during each of time periods 222 (FIG. 2). It is believed that each of portions 320 contains physiological information on the individual's ability to sustain increasing stress. Each of portions  330 represents a portion of an exercise cycle in which the heart rate of the individual falls. The heart rate often exhibits a natural overshoot phenomena at the end of portion 330, typically falling below an initial base line heart rate (prior to cycles 210-214). After overshooting, the heart rate normally recovers to a new base line heart rate. Portion 330 is believed to contain physiological information on the individual's short term ability to recover from stress. Each of top portions  325 represents the heart rate as it transitions between periods 222 and 224, which roughly correspond to time trace portions 320 and 330. In each of cycles 210-214, the individual attains a peak (i.e., maximum) heart rate during top portion 325. Peak heart rates have been found to be a significant measure of an individual's physiological condition. Each of portions  340 represents the heart rate during stabilizing periods 224 which allow the individual's heart rate to stabilize between cycles 210-214. Portions 340 are believed to contain physiological information on shifts in the resting heart rates to new base line levels in response to exercise cycles 210-214. Portion  350 represents the heart rate during post-exercise recovery period 225. Portion 350 is believed to contain physiological information on an individual's ability to recover from the cumulative effects of exercise cycles 210-214, including any shift in base line heart rates. A time trace can be further analyzed to determine other cycle parameters, such as an upward slope S up, a downward slope Sdown a peak heart rate Rpeak, and a minimum heart rate Rmin. FIG. 3a shows an illustrative cycle 214 of time trace 300. Starting heart rate R0 is determined by finding the heart rate at time t0, at or about the start of period 222. Peak heart rate Rpeak and corresponding time t5 are determined by finding the highest heart rate datum within top portion 325. Time t5 is often located at or about the end of period 222 by which time the target heart rate has been reached. Minimum heart rate Rmin and corresponding time t6, are determined by finding the lowest heart rate datum in portion 330. Time t6 is often located at or about the end of period 223 by which time the heart rate has stabilized. A heart wave index could also incorporate one or more other cycle parameters that characterize pre-exercise, intervening and post-exercise rest portions determined from the time trace. For example, resting heart rate R rest can be used to characterize any of rest portions 310, 340, and 350. Resting heart rate Rrest can be determined, for example, by averaging the heart rate after it has substantially stabilized. Further, for example, a base line slope Sbase can be used to characterize any one or any combination of rest portions. (A combination of rest portions can, for example, consist of all of portions 310, 340, and 350). Base line slope Sbase can be calculated by determining the change in the heart rate during one or more rest portions, in a manner analogous to the determination of upward and downward slopes described above. A heart wave index can be equal, for example, to the difference in the resting heart rates determined from portions  310 and 350. FIG. 9 shows a flow diagram of process  900 of one embodiment used to analyze a time trace contained in an electronic file. Process 900 begins at step 910 by selecting or receiving an electronic file for analysis. Next, in step 920, any file headers attached to the electronic file can be stripped away. In step 930, any header information can be stored in a database. Steps 920 and 930 are optional, but can be useful when the file is received in the form of an e-mail, for example. In step  950, the time trace is further analyzed by determining various cycle parameters, such as baseline slope, upward and downward slopes, and/or maxima and minima for each cycle. In addition to determining cycle parameters, a heart wave index can also be calculated in step 950. In step 960, analysis results are optionally stored in a data base. Regression analysis techniques can be used to fit the parabola to obtain coefficients A, B, and C. Any suitable statistical test (e.g., chi-square) can be used to determine the quality of the fit. At least one goodness of fit parameter (e.g., coefficient of correlation R, or coefficient of determination R 2) that characterizes the quality of the fit can also be calculated. FIG. 4 illustrates how a parabola can be fit to a top portion, such as top portion  325, to obtain one or more shape parameters. Time trace portion 400 represents a top portion of an exercise cycle. Theoretical parabola 410 represents a best fit generated, for example, by regression analysis. The heart wave index can then be determined using any of the cycle parameters and one or more shape parameters, such as the parabolic coefficients and one or more goodness of fit parameters. The heart wave index can itself be equal to a goodness of fit parameter. FIG. 10 shows a flow diagram of process  1000 of one embodiment used to fit a parabola to top portions contained in an electronic file. In step 1001, an electronic file to be analyzed is selected or received. Next, any file headers attached to the electronic file can be stripped. In step 1020, a maximum heart rate for each relevant cycle is determined, which could involve locating the top portion of each cycle. In step 1030, the top portions are fit to theoretical shapes (e.g., parabolas) using, for example, regression analysis. Parabolic coefficients are obtained and at least one goodness of fit parameter is preferably calculated for each fit. In step 1040, analysis results can optionally be stored in a data base. Similarly, FIG. 11 shows a flow diagram of process  1100 of one embodiment used to fit a parabola to resting portions in a time trace. In step 1101, an electronic file to be analyzed is selected or received. In step 1110, any file headers attached to the electronic file can be stripped away and optionally stored. In step 1120, a minimum heart rate for each cycle is determined. In step 1130, a recovery baseline is chosen. This can involve determining a portion of the time trace in which the heart rate is stabilized after recovering from a minimum determined in step 1120. In this manner, rest portions 340 corresponding to each cycle can be identified. In step 1140, regression analysis or any other type of comparable analysis routines are used to fit a parabola to each rest portion. For each fit, parabolic coefficients and/or at least one goodness of fit parameters can be obtained. In step 1150, analysis results can be optionally stored in a data base. As explained above, the shapes of the top portions and the resting portions are believed to contain information on the physiological condition of the individual. In particular, it has been discovered that abnormal physiological conditions are often associated with non-parabolic shapes. FIG. 5 shows a heart rate trace that includes two illustrative top portions  501 and 502. These portions correspond to abnormal physiological conditions because their shapes deviate strongly from symmetric parabolas 503 and 504, respectively. FIGS. 6a, 6 b, and 6 c show actual measured time traces 601, 602, and 603, of heart rate data from three different individuals. The time traces represent heart rate data collected over exercise sessions consisting of five exercise cycles (i.e., trace 601 and 602) or six exercise cycles (I e., trace 603). Analysis of pre-exercise rest portions of these traces yields baseline heart rates of 86, 58, and 78 beats per minute, respectively. Analysis also includes identification of peak heart rates and minimum heart rates for each of the last four exercise cycles in each trace. The peak heart rates are indicated by square symbols in FIGS. 6a, 6 b, and 6 c. The peak heart rates for the last four cycles in trace 601, in descending order, are 169, 164, 158, and 149 beats per minute. Similarly, for trace 602 the peak heart rates are 169, 165, 168, and 158 beats per minute, and for trace 603 the peak heart rates are 105, 102, 104, and 95 beats per minute. Analysis also includes calculating upward and downward slopes for the last exercise cycle in each trace. For traces  601, 602, and 603, upward and downward slope pairs have values of (48, 24), (72, 60) and (24, 24), respectively. In each of FIGS. 6a, 6 b, and 6 c, the pre-exercise rest portion, the intervening rest portions, and the post-exercise rest portion can be combined to form a cumulative rest portion. Analysis of the leading edge of the cumulative rest portions yields baseline slopes that are positive. The magnitude of these slopes is proportional to the rate of increase of base line heart rates during the exercise sessions. The baseline slopes for traces 601, 602, and 603 are 150.9, 60.3, and 9.4,respectively. These baseline slopes are exemplified with lines 607, 608, and 609, respectively. It has been empirically found that the baseline slope correlates positively with an individual's physiological condition. It is believed that higher (i.e., steeper) baseline slopes correspond to better physiological conditions. Thus, measurement of a baseline slope can be used to assess an individual's physiological condition and to monitor an individual's progress. By this analysis of traces  601, 602, and 603, heart wave indices of 320, 229, and 114 are obtained for the three different individuals, respectively. The relatively low heart wave index of 114 obtained from the analysis of trace 603 correlates positively with the poor physiological condition of the third individual, who was clinically found to suffer from congestive heart disease. The shape cumulative rest portions of time traces  601, 602, and 603 exhibit different degrees of parabolicity, which are believed to correspond to good, moderate, and poor physiological conditions, respectively. As an alternate or in addition to baseline slopes, the degree of parabolicity can be quantified by fitting a parabola to the cumulative rest portion. Fitted parabolas 604-606 exhibiting varying degrees of parabolicity are shown in FIGS. 6a, 6 b, and 6 c, respectively. The individual's capability can be assessed in terms of a quantitative figure of merit based on cycle parameters obtained by analyzing the exercise cycles' time trace. In one embodiment, maximum heart rate R max, which is achieved by the individual during each of the test cycles, is determined by analyzing the time trace as described above. Then, a capacity index is assigned a value that is a function of one or more maximum heart rates. For example, the capacity index can be assigned a value equal to the average of maximum heart rates achieved during two consecutive maximum effort cycles. Alternatively, a weighted sum could be used. 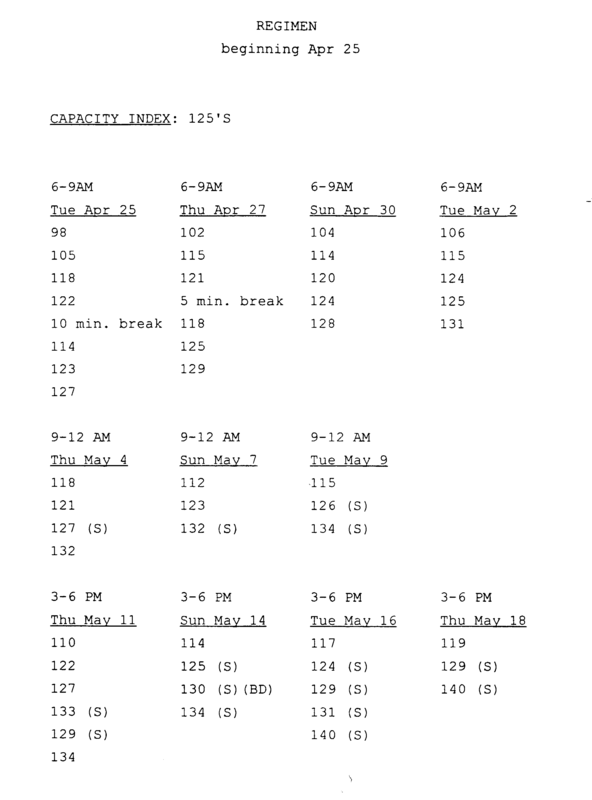 Once a capacity index is determined, an exercise regimen can be generated. A heart wave index can also be used to generate the regimen. For example, a metric, such as the capacity index or heart wave index, can be received. Then, an individualized exercise regimen can be generated using an algorithm that relates the metric to the regimen. One or both of the receiving and generating steps can use a look-up table. FIG. 7 shows illustrative look-up table  700. 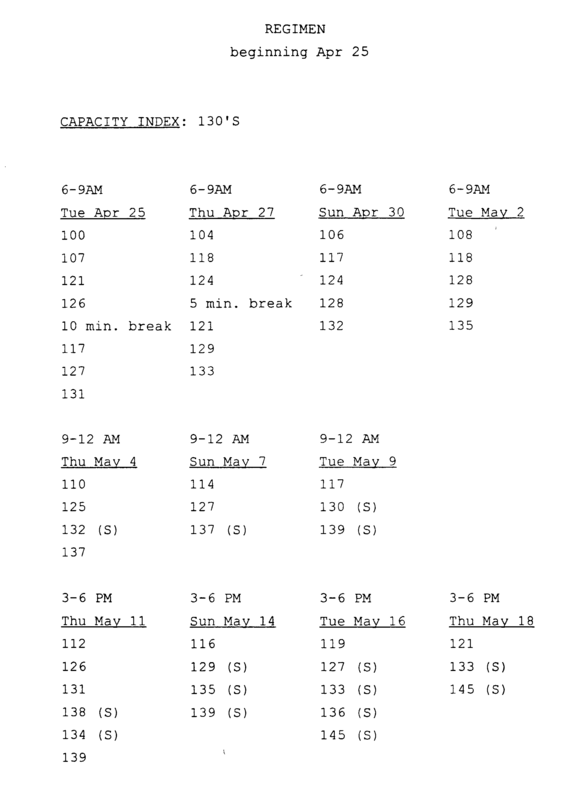 Look-up table 700 includes a plurality of capacity indices 720 a-720 m and a plurality of predetermined exercise regimens 710 a-710 m that are respectively linked to the capacity indices. Capacity indices 720 a-720 m range from 115 to 180 in steps of five units but can have any range and any size steps. The use of a look-up table can involve rounding the received metric to a nearest multiple of five or ten units, and then prescribing the exercise regimen corresponding to the rounded number. For example, a received index of  142 can be rounded to 140 (index 720 d). Then, using look-up table 700, exercise regimen 710 d can be selected and prescribed. Exercise regimens  710 a-710 m can be empirically generated. In this case, the regimens preferably account for the wave nature of cardiac activity and apply the principles for therapeutic treatment and bio-rhythmic feed back taught by Dardik, U.S. Pat. Nos. 5,800,737, 5,752,521, 5,163,439, and 5,007,430, incorporated by reference herein. 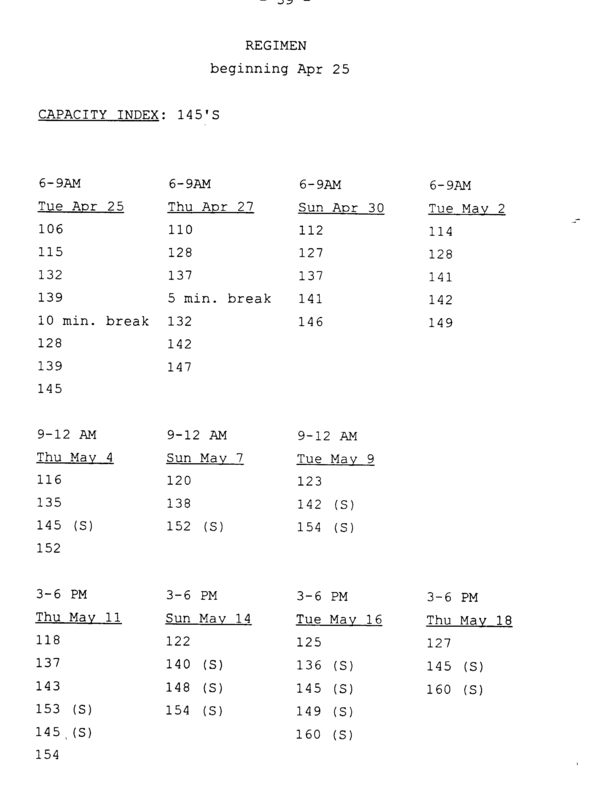 Appendix A, for example, contains an actual set of exercise regimens designed for individual's with capacity indices ranging from 115 to 180 units. 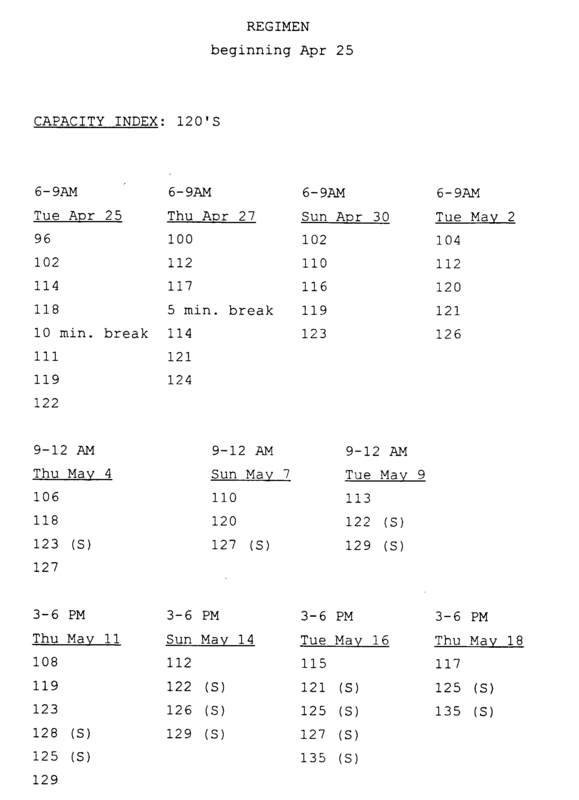 The exercise regimens of Appendix A can be used, for example, in look-up table 700. Each of regimens  710 a-710 m can include a plurality of exercise sessions to be performed by the individual over a time period. The time period can be any convenient period of time, such as about one lunar month. Each exercise session preferably includes a plurality of exercise cycles. The exercise cycles can include one or more warm-up cycles and one or more critical cycles that have target heart rates based on a metric. The features of these exercise regimens can be better understood in conjunction with FIG. 8, which shows illustrative one month exercise regimen  800 starting Apr. 25, 2000. Regimen 800 is designed for individuals with capacity index 810 having a nominal value of about 115 units. Regimen 800 includes eleven exercise sessions 821-831 and rest week 832. Each of sessions 821-831 includes a plurality of exercise cycles, each of which is designated by a target heart rate and can contain a break if desired. 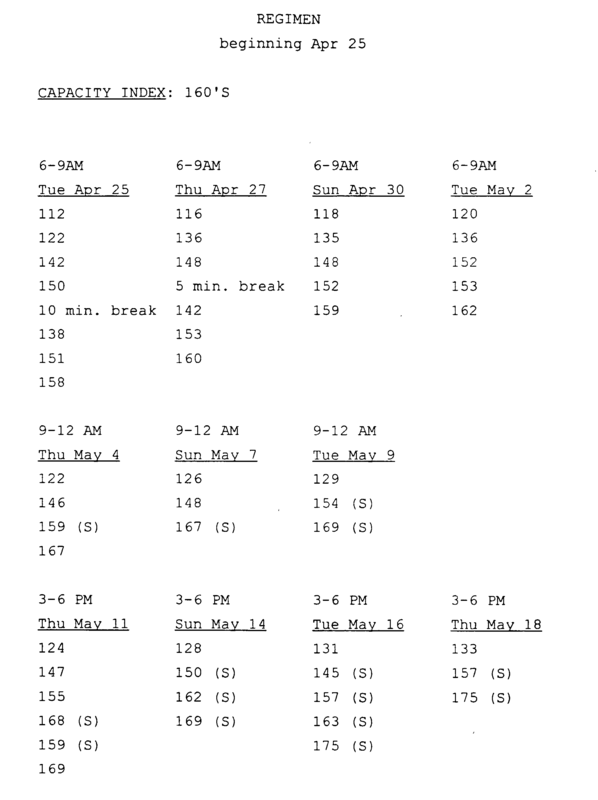 The time period over which the sessions are performed can begin with an initial rest period (not shown), end with a final rest period (rest week  832), and include intervening rest periods (April 26, April 28-29, May 1, May 3, May 5-6, May 8, May 10, May 12-13, May 15, and May 17) between the exercise sessions. Intervening rest periods are preferably at least about one day long, while final rest period 832 can be between about 4 days and about 10 days. Regimen 800 is to be performed over about four weeks (including final rest week 823). The sessions in an exercise regimen can be synchronized with a lunar cycle. In FIG. 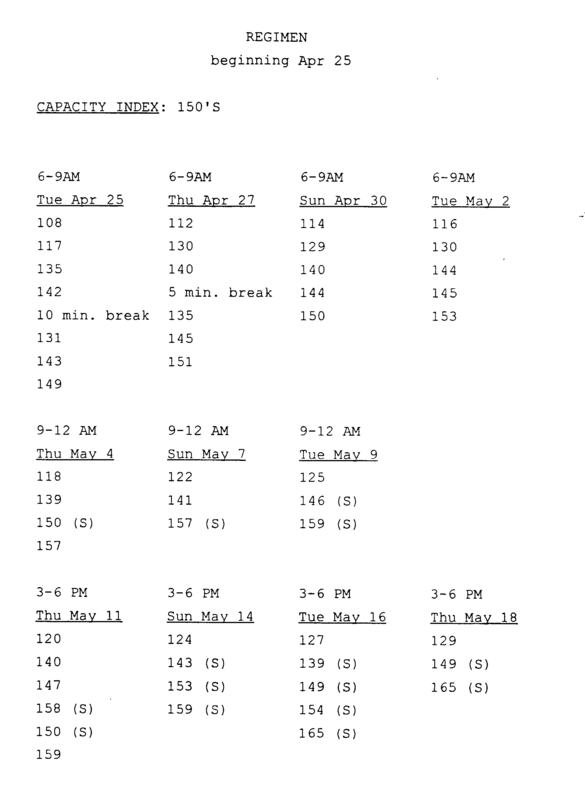 8, for example, regimen  800 is scheduled to start on Apr. 25, 2000 about three weeks prior to a full moon. The exercise sessions can also be synchronized with a circadian rhythm of the individual. For example, in FIG. 8 sessions 821-824, which are to be performed during the first week of the regimen, are scheduled between 6 a.m. and 9 a.m. This time period corresponds to a period of low circadian activity. 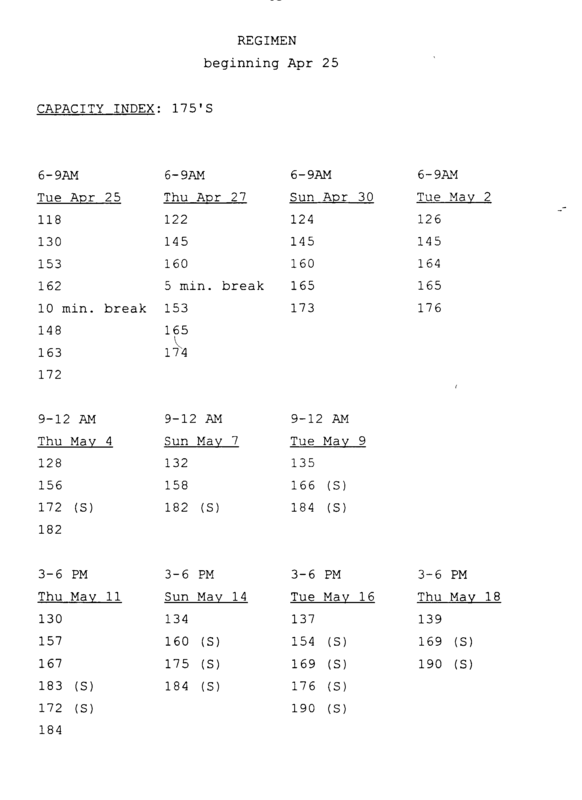 Sessions 825-827, which are to be performed during the second week of the regimen, are scheduled to be performed between 9 a.m. and 12 p.m. This time period corresponds to a period of moderate circadian activity. Sessions 828-831, which are to be performed in the third week are scheduled to be performed between 3 p.m. and 6 p.m. This period corresponds to a period of high circadian activity. The regimens used in the present invention can have a plurality of critical cycles that have sequentially increasing target heart rates. As used herein, a critical cycle is a cycle that has an associated target heart rate (i.e., is not a warm-up cycle without a defined target heart rate). For example, in session  821 the target heart rates increase sequentially for the first four cycles from 94 beats per minute to 114 beats per minute, and again increase sequentially for the last three cycles from 108 beats per minute to 118 beats per minute. It will be appreciated that the first set of four cycles has a lower initial target heart rate than the second set of three cycles. Also, the initial target heart rate of the second set can be lower than the final target heart rate of the first set. Preferably, the target heart rates for critical cycles within an exercise session increase substantially superlinearly from one cycle to the next. Critical cycles can have target heart rates that range up to about 20 beats above the metric being used. For example, sessions  830 and 831 have critical cycles with target heart rates of 130 beats per minute, which is 15 beats per minute higher than the nominal capacity index (i.e., 115). Substantially all exercise sessions include a maximum cycle that has a target heart rate that is greater than that for its previous cycle. Preferably, the target heart rates for the maximum cycles increase substantially linearly from one session to the next. For example, in sessions  821-831, the highest target heart rate in each session sequentially increases in small increments from 118 beats per minute to 130 beats per minute (with the exception of a small decrease for session 823). Also, a regimen can include exercise cycles that alternate with rest periods. The regimen can be divided into an earlier part and a later part, with the later part having more spike cycles than the early part. For example, in FIG. 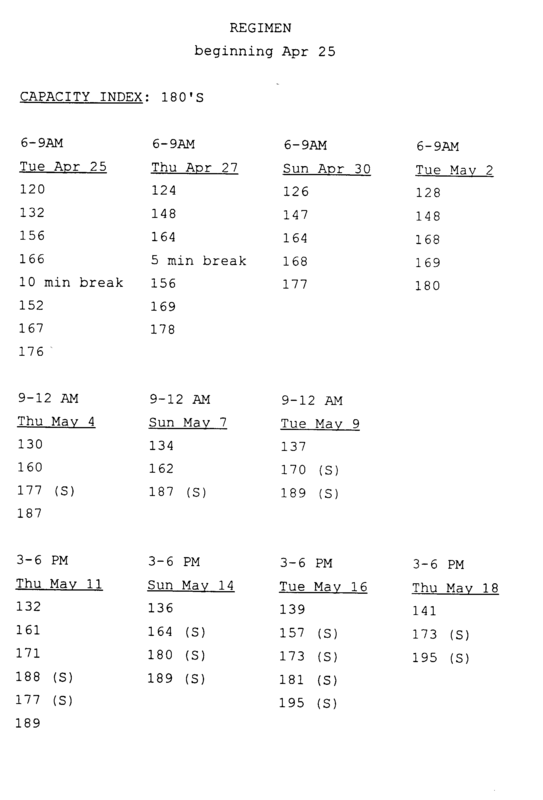 8, sessions  821-825 are scheduled to be performed in the first week or so and include no spike cycles, while sessions 827-831 are scheduled to be performed in the second and third weeks and include several spike cycles. instructions to export said exercise regimen to said individual using an output device. at least one critical cycle that has a target heart rate, wherein said target heart rate is based on said metric. 3. 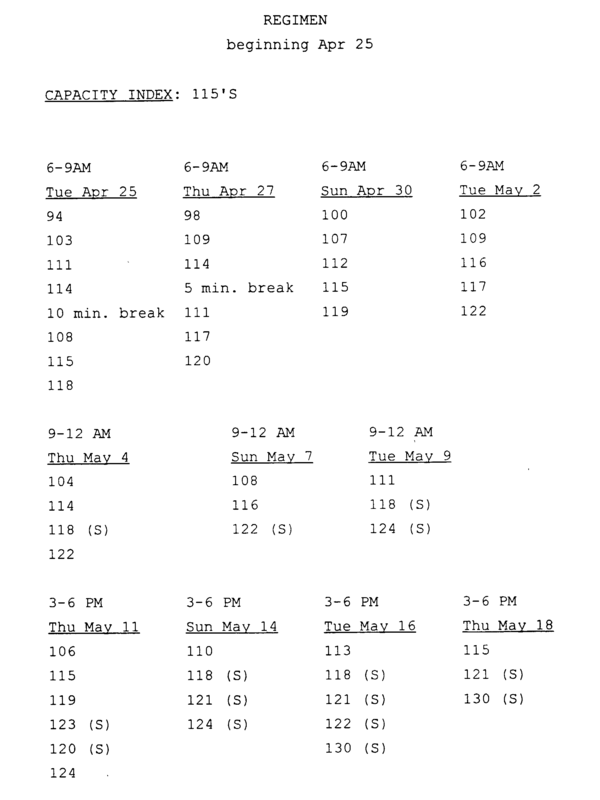 The computer-readable medium of claim 1 wherein said instructions include instructions for synchronizing said regimen with at least one temporal phenomenon selected from a group consisting of a lunar cycle and a circadian rhythm. 4. The computer-readable medium of claim 1 further include instructions for generating a guide based on said regimen, said guide directing said individual on how to exercise. 5. The computer-readable medium of claim 1, further comprising instructions for communication over links within said system wherein said links comprise an electronic network selected from a group consisting of local area networks, wireless networks, wired networks, wide area networks, the Internet and any combination thereof. 6. The computer-readable medium of claim 1, further comprising instructions for accessing linked databases including said catalogue, through an electronic network, wherein said networks are selected from a group comprising of local area networks, wide area networks, wired networks, wireless networks, the Internet and any combination thereof. 7. A computer-readable medium of claim 1, further comprising instructions for controlling said system through an electronic network, wherein said networks are selected from a group comprising of local area networks, wide area networks, wired networks, wireless networks, the Internet and any combination thereof. 8. A computer-readable medium of claim 1, further comprising instructions for communication external to said system through user interfaces selected from a group comprising of web pages, display monitors, terminals, modems, audio devices, wired devices, and wireless devices or any combination thereof. US922434A (en) * 1909-01-25 1909-05-18 Morris Koppelman Coat-collar. US956819A (en) * 1909-10-21 1910-05-03 Nat Dump Car Co Dump-car. 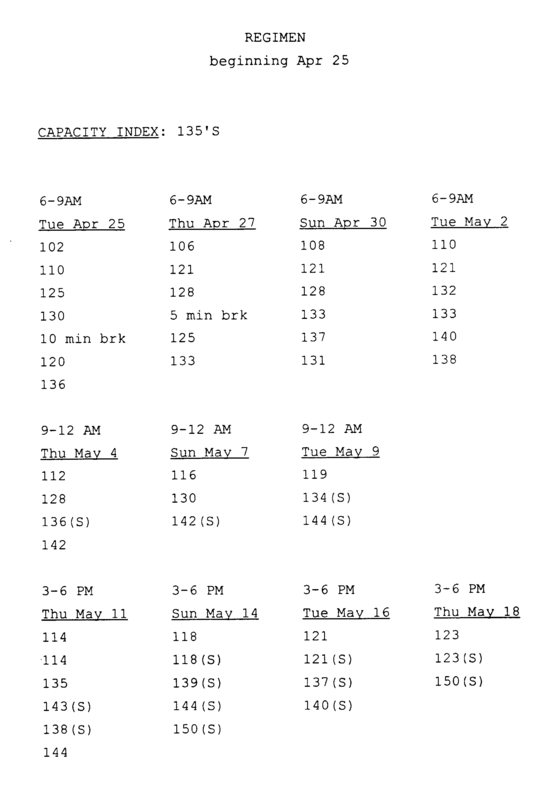 DE148819T1 (en) 1983-06-30 1985-11-21 Sri International, Menlo Park, Calif., Us Method and apparatus for diagnosis of diseases de coronary arteries. Brennan et al. 2001 Do existing measures of Poincare plot geometry reflect nonlinear features of heart rate variability?